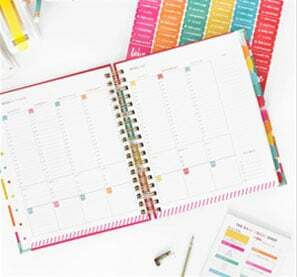 Being vegetarian, I am constantly trying to find or create recipes that will satisfy my meat-eating family. My husband flat-out refuses to eat tofu, and we won’t even talk about the ill-fated polenta incident of 2014. The food I make has to look “normal” and taste good. Chili, tacos, spaghetti…unadventurous as they may be, the closer my meals come to good old fashioned “comfort food,” the better they are received. 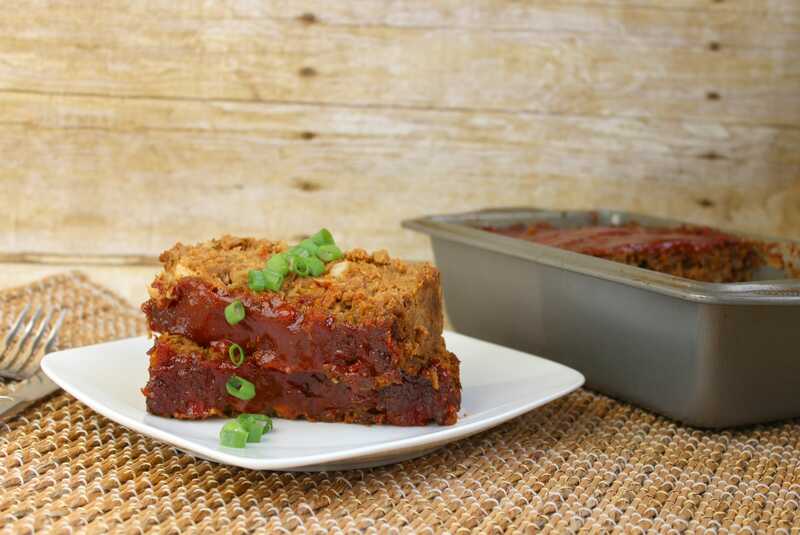 Vegetarian Meatloaf is something I have been making for years. 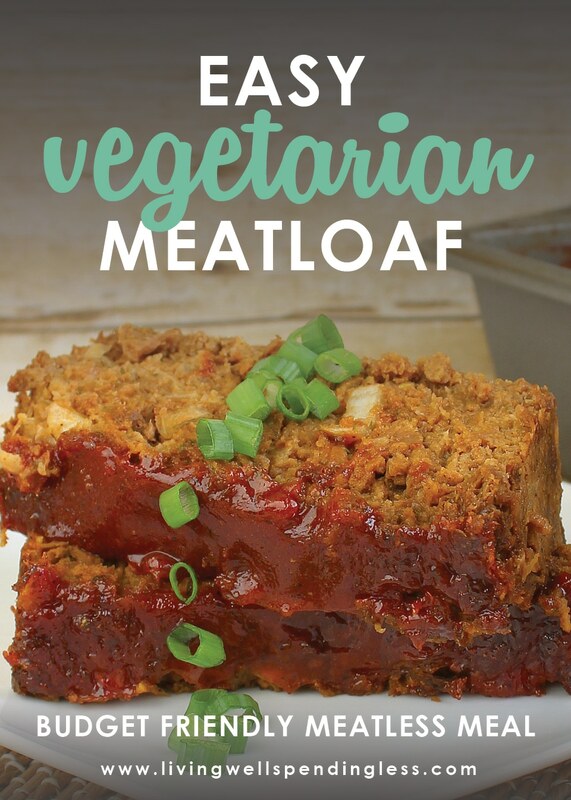 It is extremely filling, has less than half the calories of regular meatloaf, and tastes delicious. It is always a huge hit in my house. There aren’t a lot of recipes that are kid-friendly, but this one is pretty foolproof. Even better, it is made from all the ingredients that I normally keep on hand. *Technically, traditional Worcestershire sauce contains anchovies and is not vegetarian, however, there is a vegetarian version available! 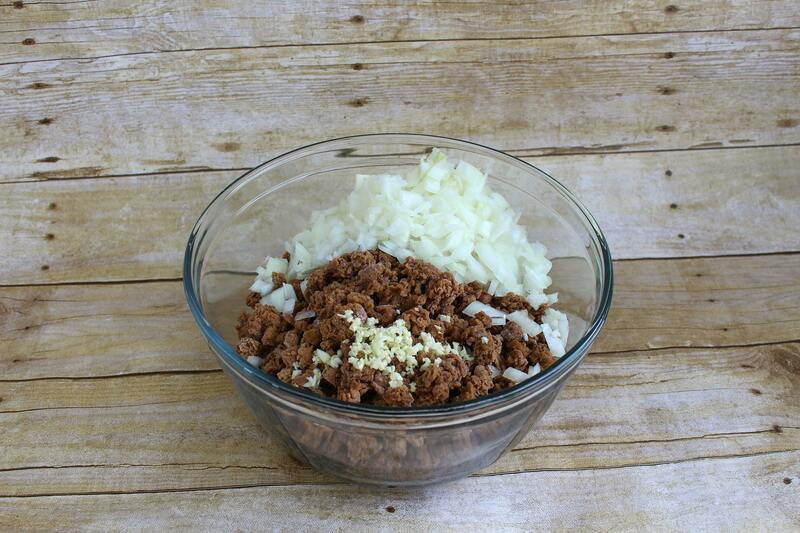 Step 1: Pour the vegetarian protein crumbles into a bowl. They can still be frozen, but beat the bag against the counter before opening to get rid of any large chunks. Step 5: Spray loaf pan with cooking spray; press mixture into pan, patting down firmly. Cover with foil and refrigerate 1-2 hours (or overnight), then bake, covered, at 350 degrees for 90 minutes. Step 6: To make topping, mix together ketchup with brown sugar, dry mustard, salt, & pepper. Step 7: After the meatloaf has cooked for 60 minutes, remove foil and spread ketchup mixture over top. Return to oven for remaining 30 minutes. This budget friendly meatless meal is sure to become a new family favorite! 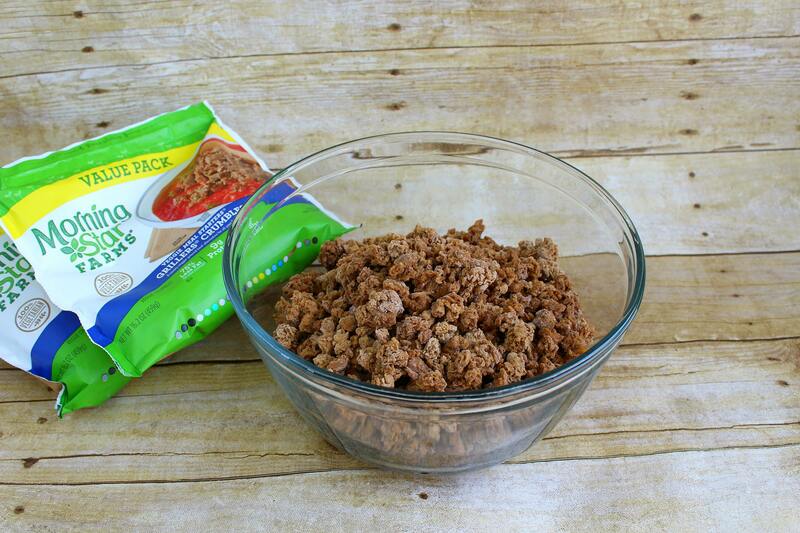 Pour the vegetarian protein crumbles into a bowl. They can still be frozen, but beat the bag against the counter before opening to get rid of any large chunks. Add spices then blend together. These can be adjusted to taste or to the whims of your kids if you have "helpers." Add milk, eggs, & Worcestershire. 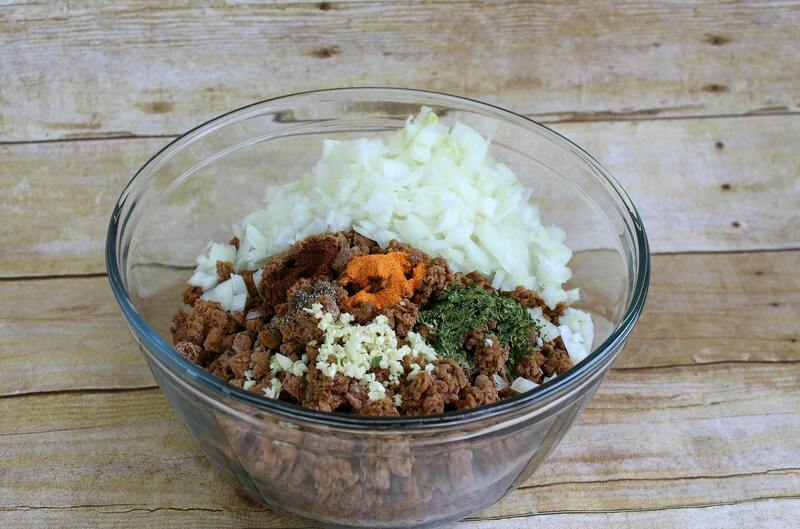 Blend well, then add bread crumbs and mix together. Add more bread crumbs if needed to make sure the mixture holds together. Spray loaf pan with cooking spray; press mixture into pan, patting down firmly. Cover with foil and refrigerate 1-2 hours (or overnight), then bake, covered, at 350 degrees for 90 minutes. 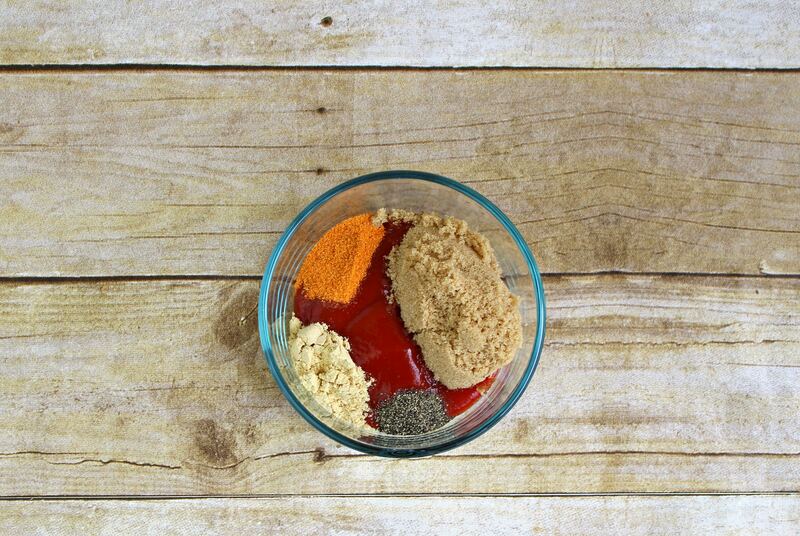 To make topping, mix together ketchup with brown sugar, dry mustard, salt, & pepper. 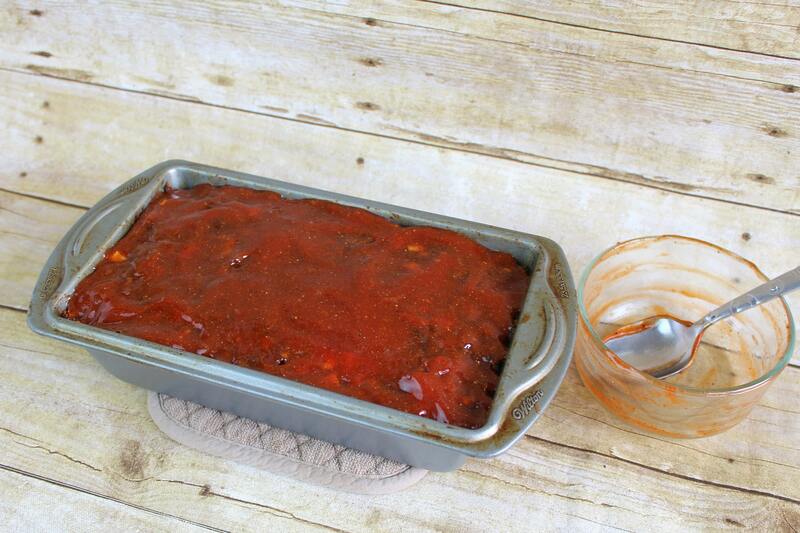 After the meatloaf has cooked for 60 minutes, remove foil and spread ketchup mixture over top. Return to oven for remaining 30 minutes. Yum! I’m also vegetarian and make meatless loaf from time to time, very similar to yours, except mine isn’t in the oven that long. Our version of vegetarian crumbles is Yves Just Like Round. I like your topping, will give that recipe a go next time! Yum, this sounds delicious. I’m always looking for easy, yummy vegetarian recipes that even meat eaters would love! Looks like a great recipe. I can definitely make this vegan for my family. (My husband will eat fake meat and tofu, but he won’t touch fake cheese!) Can’t wait to try it! 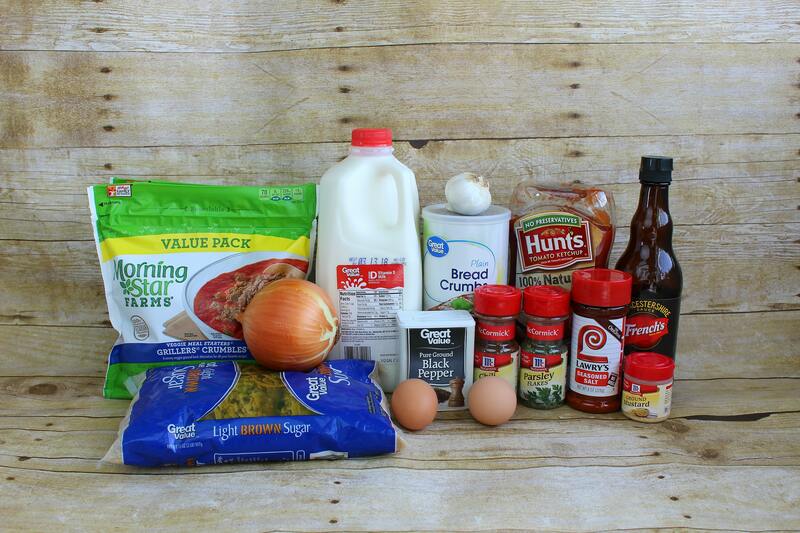 I’ve been making your meatloaf for…seems like for years now. 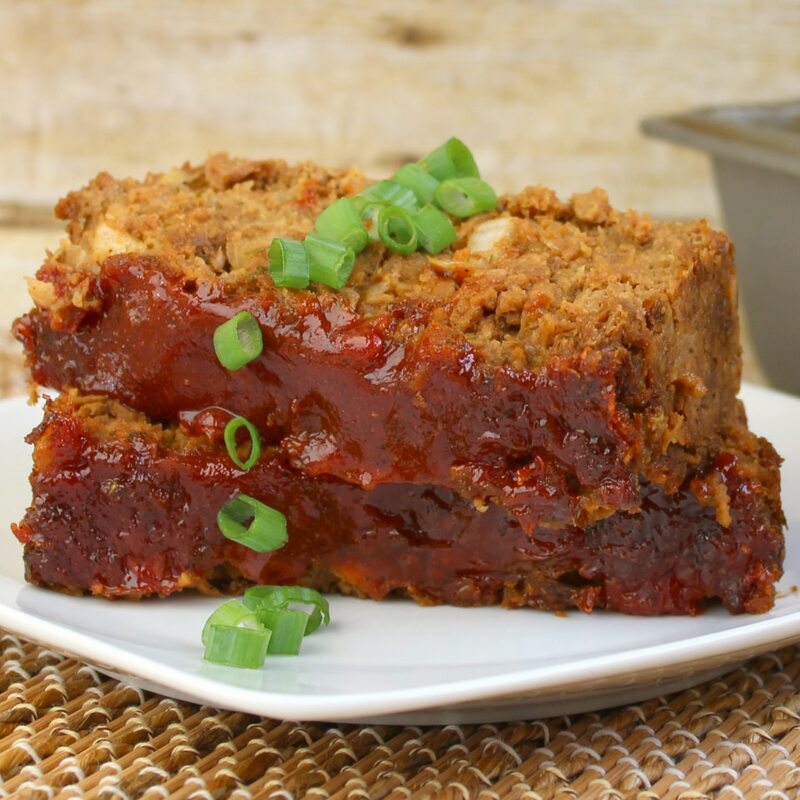 Anyhow, it is the most delicious meatloaf recipe I ever tried! 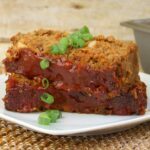 If we went back to eating meat, my husband and I both agree, we would not make “meat” loaf, but I would continue to only make this recipe. 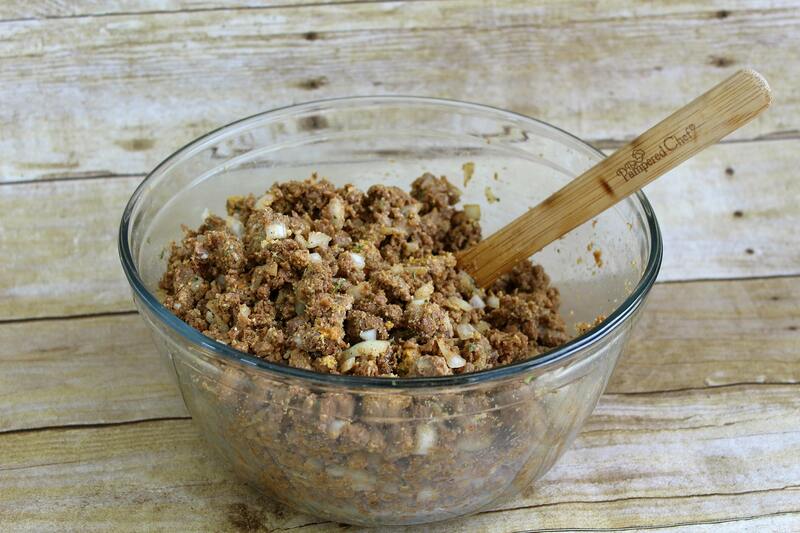 Only thing I do differently is to prepare TVP crumbles with ingredients that make it taste like ground beef. Other than that, I have followed your recipe to the letter and it is just the best!!! 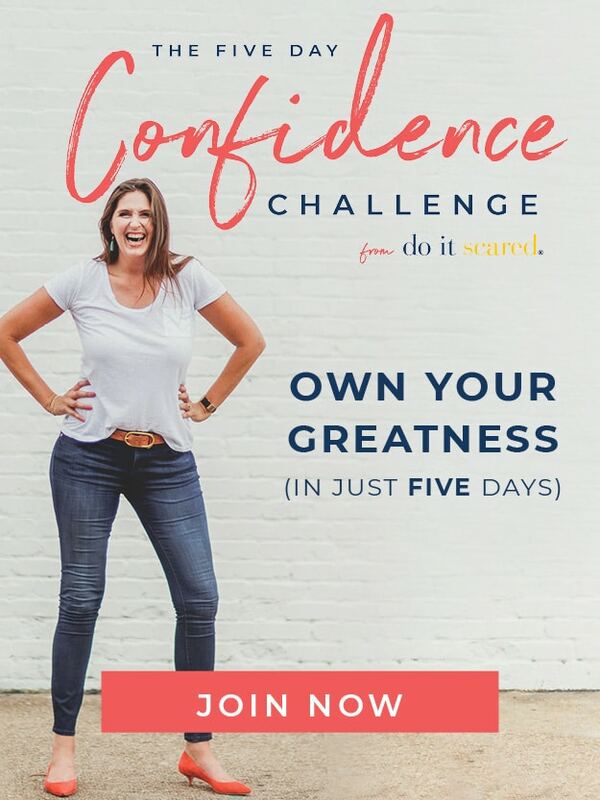 Could you clarify step #7 please? After you add the ketchup mixture, do you put the foil back on? 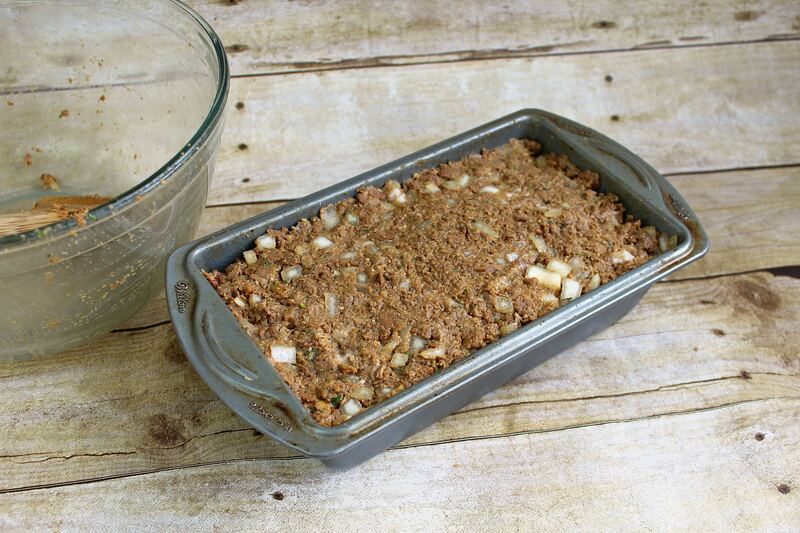 Or do you bake the meatloaf uncovered for 30 minutes? Can u usenegg substitute like flax eggs instead?